Fishing for black sea bass has gained popularity in NH over the past few years. Cape Cod, Massachusetts has historically been the accepted northern range of this species but numbers of fish inhabiting New Hampshire Coastal waters have grown to a level able to support a fishery. Like many other fish species on NH’s coast, they migrate to stay in their optimum temperature range. This means they will migrate inshore in the spring and move offshore where the water temperature is more stable, as the coastal waters cool in the fall. You can find black sea bass in areas that provide structure such as wrecks and rock piles and have been taken all along the New Hampshire coast as well as in the Piscataqua River. Black sea bass are protogynous hermaphrodites, protogynous meaning “female first”, and are mature by the age of 1 to 3 years. Spawning takes place in spring in inshore waters, the males will take on a blue hue and develop a hump on their heads. Black sea bass prey on invertebrates such as crabs and worm, as well as juvenile lobsters and small fish. 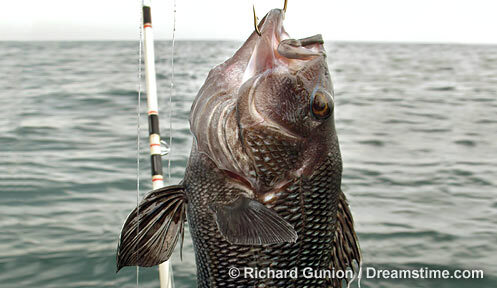 Catching Black Sea Bass: Black sea bass can be taken from boat or shore, target areas with underwater structure such as rock piles, or bridge and pier pilings. Use a baited rig consisting of a small sinker (2 to 6 oz depending on current) with the hook tied about a foot above it, a dropper loop or swivel can be used for this. Squid is particularly good bait, but worms, fish and crabs also work.